Speedy Tuesday - More Moon Phase! Speedy Tuesday – More Moon Phase! It is Speedy Tuesday! 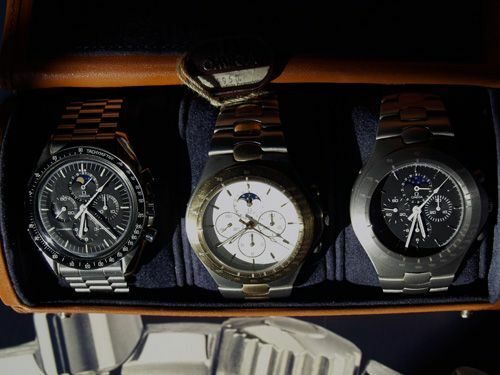 In the past, we’ve shown you a couple of Speedmasters with Moon Phase complications. There was the first Speedmaster Professional Moon Phase from 1985 that we’ve covered in August, the Speedmaster Professional Moon Phase ‘Replica’ or ‘Broad Arrow’ we did in July, the new Speedmaster Professional Moon Phase Aventurine in September and the platinum skeleton Speedmaster Professional Moon Phase we did in October. One of our readers from Germany, who is a serious Omega (Speedmaster) collector, submitted his trio of Moon Phase Speedmasters to us. We briefly mentioned all three of them in our Speedy Tuesday article in August about the Moon Phase watches (click here), but without proper explanation and images. You might remember that Omega used the hand wound Lemania based chronograph movement caliber 861 for the Speedmaster Professional with Moon Phase as well, with an added Moon Phase module on top. Omega renamed this movement to caliber 866 (which changed later on to caliber 1866 and actually is still being used). 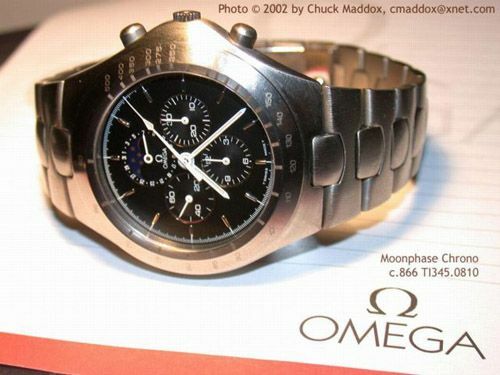 Omega only used 2000 of these movements in the 1980s (1985 / 1986) for their moon phase watches. 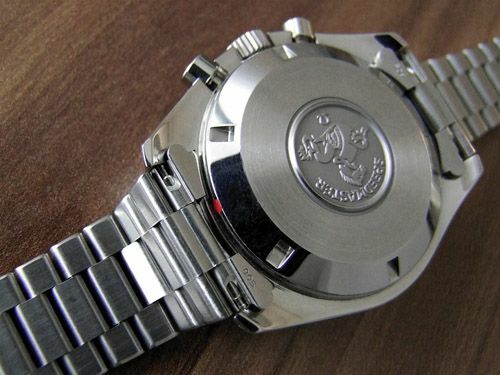 1300 caliber 866 movements were used for the Speedmaster Professional ref. ST345.0809 (or 145.0809 for the version with a strap instead of a bracelet), 700 were used for the lesser known ref. 345.0810 Speedmaster. These 700 Speedmaster ref.345.0810 watches, based on the Speedmaster Mark V design, were all produced for the German market. 400 pieces of them were made in titanium, 300 in a gold/titanium combination. These 700 Speedmaster Moonphase watches (ref.345.0810) are rare and we’ve only seen a few during the years. Our Fratellowatches watchmaker (friend of the show) has one. Actually had two, and sold one to Chuck Maddox years ago (which can be seen here). We were more than happy to learn that one of our (German) readers has the whole trilogy of Speedmaster Moon Phase caliber 866 complete and wants to share it with our readers. A bit clearer is this picture that Chuck Maddox made of his ref.345.0810 in titanium. 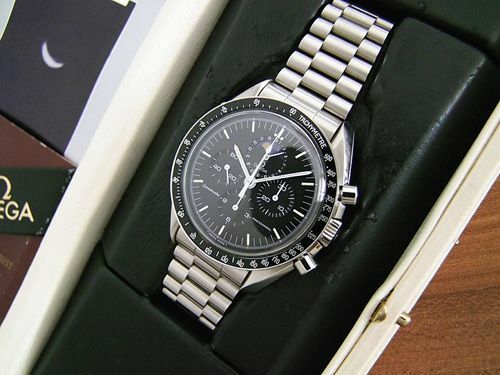 A big thank you to our reader and Speedmaster-collector from Germany. All pictures are his, except for the last one, which belongs to the Chuck Maddox website. Keep sending us those Speedies people!